Abstract: Research on credibility and faking is essential in different areas of psychology and especially in the forensic field. The investigations performed by Arce and Farina are recognised as being among the most notable of all the existing investigations, with the development of the Global Evaluation System (GES) that has been found to be especially effective in assessing the credibility of testimony and malingering mental health cases. The application of this procedure to 20 people accused under the judicial system of Social Security fraud for malingering a permanent work incapacity by way of a mental disorder, showed that the procedure described in the GES was effective for the correct classification of the malingers. Furthermore, data supported the categorising of malingers, consisting of whole malingers (those mentally healthy that effectively simulate a permanent work incapacity), partial malingers (those with temporary or no mental work incapacity disease, who claim for a permanent work incapacity), over malingers (those with permanent work incapacity mental disorders who exaggerate the severity of their mental health) and incompetent malingers (those who claimed to have permanent work incapacity but in their mental health assessment, were observed to have no mental health disorder.). Protocols for the forensic evaluation of malingering fitted to each categorization derived from the results obtained. The theoretical and practical implications of forensic assessment are discussed. Keywords: malingering; MMPI-2; SCL-90-R; forensic psychological assessment; permanent work incapacity, Global Evaluation System (GES). Abstract: Sexual debut at early ages has been demonstrated facilitate different risky sexual behaviors across the active sexual life in both men and women. 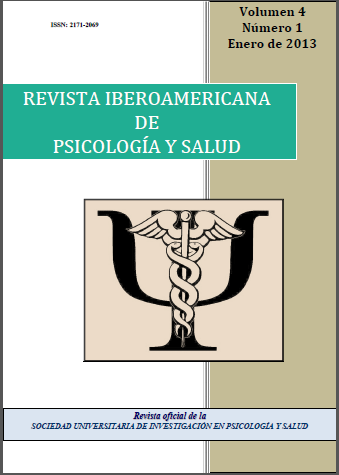 On the basis of this assumption a cross-sectional study was carried out to assess sexual behavior with casual partners among two hundred and sixty-four university women from Hermosillo, Mexico. Results shows that biological age, age of sexual debut, two types of motives ("Because the opportunity was there" and "Because I was physically attracted to them"), two types of biological states ("I was sexually aroused" and "I was under the influence of alcohol"), and one social circumstance ("I was in a party") were predictors of that behavior The results of this study show that university women are still practicing risky sexual behaviors, and educational efforts must be considered to training women in behavioral competencies to promote the practice of preventive behaviors. Keywords: sexual debut; casual partners; women; motivation; HIV infection. Abstract: Today's university is facing up to demanding challenges, especially in connection with the quality of teaching-learning process. In this context, the skills like thinking styles are particularly relevant in order to mediate a greater or less adjustment to the learning required. The aim of this paper is double: to know what type of profiles show university students (these profiles are raised and analyzed by the Threefold Model of Intellectual Styles of Sternberg and Zhang) and to discuss about students adjustment to the new demands of the European Higher Education Area (EHEA) theoretically and according to profiles of thinking styles of students. A sample of 279 college students form fifteen degrees, has answered to the Thinking Styles Questionnaire for Students. The information provided by a cluster analysis has identified five profiles of thinking styles. Results are discussed in relation to the validity of the three-factor model of Sternberg and Zhang and, regarding to the academic implications of each of the five profiles obtained, may have relation to the type of learning the EHEA. Keywords: cognitive styles; profiles; European Higher Education Area;competencies; academic performance. Abstract: It was designed a study with the aim of establishing the relationship between perceived stress, anger expression and burnout syndrome in housewives. For this we collected a sample of 226 Mexican women. Three measure instruments (Perceived Stress Scale [PSS14], Anger Expression [AX] scale of the STAXI-2 and Housewives Burnout Questionnaire [CUBAC-21] were applied to this sample. Initially we proved the internal consistency (α = .83) of the scale SPP14 and found evidence about the adequate fit to a correlated two-factor model, χ2/df = 2.33, RMSEA = .08. Thereinafter we contrasted three models of the relationship between perceived stress, anger expression and burnout syndrome. The model with the best fit, χ2 (1, N = 226) = 0.92, p = .34, RMSEA = .01, showed that support lack complaints increase stress and carry to exhaustion, stress accentuates anger and increases exhaustion; in addition, anger contributes to support lack complaints. Keywords: stress; anger; burnout; housewives; emotions.